This Transpersonal Hypnotherapy Course (includes Fundamentals of Hypnosis Course) COMPANION Tuition leads to both the Hypnotist Hypnotherapist certifications. It is a comprehensive, in-depth, professional study of Transpersonal Hypnotherapy. You learn a variety of methods for a wide range of clientele so you can determine each client’s particular needs and apply the most appropriate technique. Watch live hypnotherapy sessions on DVDs to master techniques and develop skills. Closely observe physiological changes in clients. Rewind and re-watch to truly learn how to give successful sessions yourself. You will also benefit from the valuable business building ideas included in this course. During your training you can practice on family, friends and co-workers. It is amazing how people come out of the woodwork and request a session when they hear you are learning hypnotherapy. While you are learning you can give these sessions for free. Then after you complete the training you can charge for sessions. You can also practice with other THI students by phone. 150 hours of demonstrations, exercises, readings and practical applications. Up to 52 hours of innovative step-by-step training on 26 high quality professionally produced DVDs. Up to 2 hours of step-by-step training on CDs. 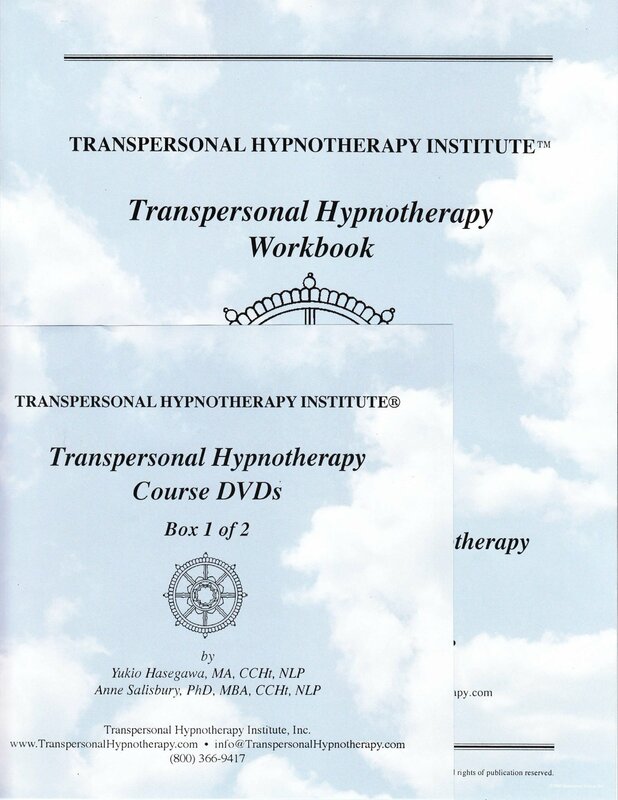 The complete “Transpersonal Hypnotherapy Workbook” with over 300 pages. Feedback and evaluation on 2 of your recorded practice sessions (included yet optional). The “Transpersonal Hypnotherapy” certificate of completion suitable for framing. The “Hypnotist & Hypnotherapist” certification suitable for framing. The two professional titles of “Transpersonal Hypnotherapist” and “Hypnotherapist” which can be used in your promotional materials. Unlimited fax and email support. Introduction to Transpersonal Hypnotherapy: The Foundational Premise, The Philosophy of Transpersonal Hypnotherapy, Three Realms of Consciousness, Components of Transpersonal Hypnotherapy. Introduction to Hypnosis: History of Hypnosis, Orienting a Client to Hypnosis & Hypnotic Trance, Myths & Misconceptions, Conscious, Subconscious & Unconscious Mind: An Ericksonian Viewpoint, Applications for Hypnosis. Inducing and Monitoring Trance States: Conditions to Arouse a Hypnotic Trance State, Physical Characteristics of Trance, Levels of Trance, Styles of Hypnotic Inductions, Permissive Language, Guiding a Client into Trance, Deepening Techniques, Bringing a Client Out of Trance, Suggestibility Testing/Trance Ratification, Pacing and Leading. Inducing and Monitoring Trance States (continued): Suggestibility Testing/Trance Ratification, Pacing and Leading. Language of Hypnosis: Speaking the Language of Hypnosis, Guidelines for Effective Suggestions, Post Hypnotic Suggestions, Using Thoughts, Feelings & Behaviors as a Stimulus to Elicit New Responses, Contingent Phrasing, Verbal Predicates: Sensory Modes. Self-Hypnosis: Steps for Self-Hypnosis, Guidelines for Effective Suggestions, Hypnotic Language Examples. Transpersonal Journey Work: Components of Transpersonal Journey Work, Jung’s Concept of Complexes, Role of the Body in Therapeutic Practices, Two-Way Communication on the Causal Plane, Contacting Inner Archetypes for Guidance and Resources, Journey for Guidance & Resources, Releasing Parents: a Rite of Passage, Retrieval Work, Abreaction Reframing, Problem Solving Strategies. Past Life Regression: Ways to Present Past Lives, Possible Clues, Approaches to Working with Past Life Issues, Reframing Past Life Trauma, Atoning for Overt Acts, Inspecting Contracts. Shadow Work (Healing your Dark Side): Dynamics of the Shadow Self, Ways of Working with the Shadow on a Continuing Basis, Techniques for Working with the Shadow in Session. Circle Integration (Integration into Wholeness): Sub-Personality Theory and Theorists, Characters, Archetypes, Principles of Circle Integration Work, Advanced Techniques. Phobias, Weight & Smoking: NLP Phobia Cure, Meeting Fundamental Needs in Addictions, Weight Management, Smoking Cessation. Creating & Maintaining Your Practice: Establishing a Practice, Setting up Your Business, Creating Safety, Transference & Countertransference (Client & Therapist Relationship), Hypnotherapy Intake Form (Interviewing Skills), Client Policies, Increasing Your Practice, Format for Ongoing Clients. Protocol Flow Charts: Overview of a Transpersonal Hypnotherapy Session, Anatomy of a Session, Two-Way Communication, Journey for Guidance & Resources, Releasing Parents: a Rite of Passage, Retrieval Work, Abreaction Reframing, Reframe Past Life Incidents, Atone for Past Life Overt Acts, Inspect Past Life Contracts, Meeting the Shadow, Circle Integration. Forms: Giving Practice Sessions, Certification Exam (Open Book).